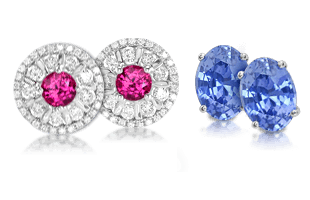 Love rings have an extensive ancient tradition with modern trends for their wearing as well. 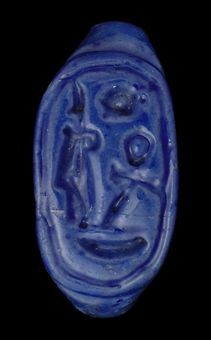 An Egyptian blue glazed ring. Just as the history of rings began in ancient Egypt, so does our traditional means for wearing them. The Egyptians, as well as the Greeks and Romans, typically wore their love or betrothal rings on the third finger of the left hand. They believed this finger held a special vein, called the vena amoris or vein of love, which was linked directly to the heart. This same finger was also called the digitus medicinalis, and it was used to stir potions and medicines in the belief that the heart would be alerted if there was poison in the mix. 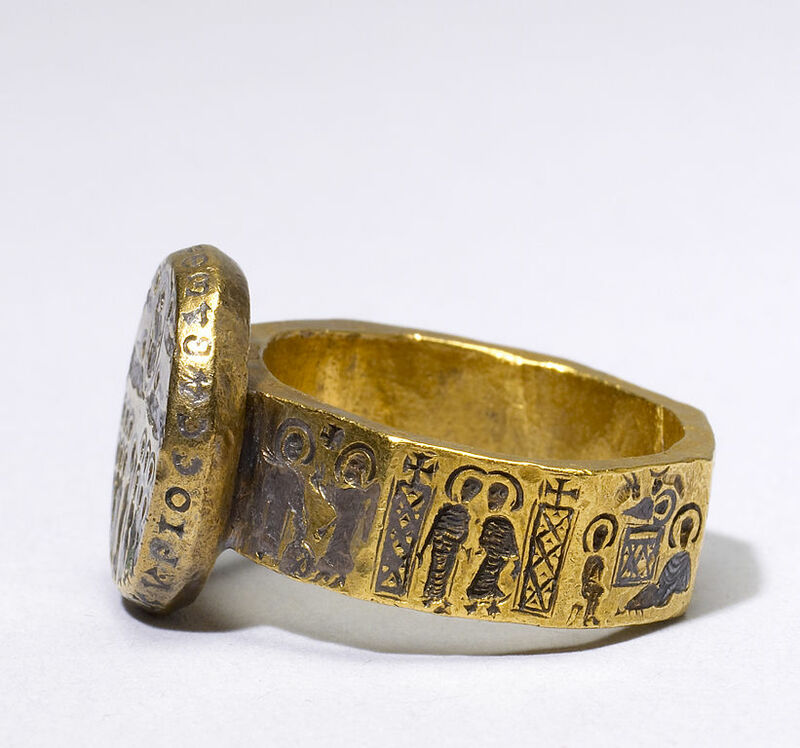 This rare Byzantine marriage ring depicts eight scenes from the life of Christ, which were said to hold protective powers for the wearer. 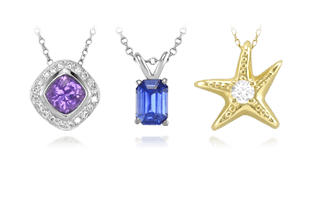 There are also practical reasons for the placement of love rings on the left hand. In ancient ceremony, when the man reached out with his right hand to place the ring on his intended, he naturally touched the bride’s left hand. Perhaps there was a more mundane reason as well. The left hand is typically used less than the right–the third finger of which is the least extensible–so it is the best place to wear an item of considerable value. Still others speculate that the left hand was chosen because it symbolized ancient women’s deference to their husbands. 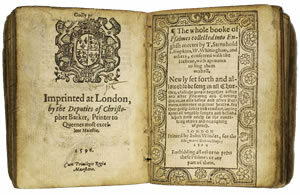 A later version of the Book of Common Prayer, from 1596. As time passed, tradition began to vary. The Anglo-Normans wore the wedding ring on the middle finger of the right hand. Early Christians wore the wedding ring on the right hand until after the Reformation. In medieval England, a bridegroom was expected to recite “In the name of the Father, the Son, and the Holy Ghost” as he slid the ring part way up his bride’s thumb, index, and middle fingers in sequence. He would then place the ring on the next finger—the third finger of the left hand. This practice was finally formalized in the 1549 Book of Common Prayer, which laid out the details of modern Protestant weddings. 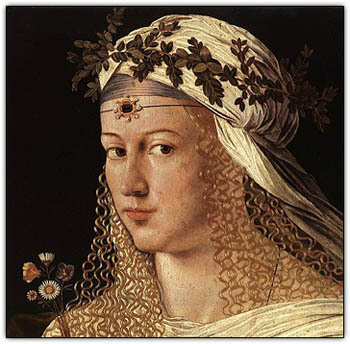 A record of Lucrezia Borgia’s (pictured) marriage to Giovanni Sforza in 1493 indicates that twin gold rings set with precious stones were exchanged. The bride’s ring was placed on the fourth finger of the left hand, and the groom’s on the little finger. In the West, wedding rings were not worn continuously until the 19th century; they were instead reserved for important “dress” occasions. In Europe in the 16th and 17th century, it was fashionable to wear the wedding ring on the thumb. Sometimes it was worn on the index finger. Louisa of Prussia was known to wear her wedding ring on the little finger of her right hand. 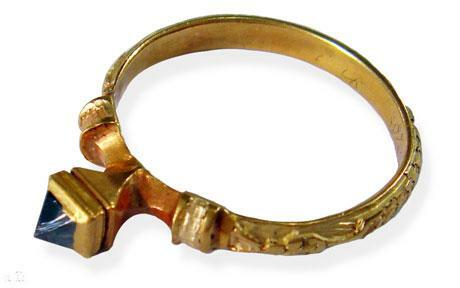 It was traditional for Russian grooms to wear their ring on the index finger of the right hand. At the turn of the last century, Hindu women wore rings on the large toe of the left foot to symbolize their married state. A medieval wedding ring featuring a black diamond. Starting in the Middle Ages, men often wore a betrothal ring suspended from the band of their hat, both as an ornament and as an advertisement for eligible women. At about the same time, rings started to pass down from one generation to another as heirlooms. As such, they were not always worn on the finger, but on cords around the neck, attached to the sleeve, or tied among the strings of a neck ruff. 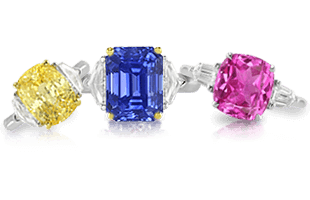 Promise or friendship rings can be worn on any finger, but those symbolizing pre-engagement are generally worn on the third finger of the right hand so they are not confused with an engagement ring. Friendship rings can be worn on any finger, but as they are exchanged between friends, it is generally best to avoid the left ring finger so that no romantic undertones are indicated. In some European countries, the wedding ring is the same as the engagement ring. This band is usually either (1) shifted from the right to left hand when the couple is married, or (2) worn on the left hand continually, but engraved for the wedding. Most men and women around the world wear the wedding band on the third finger of the left hand. However, in some countries, men and women wear their wedding ring on the third finger of their right hand. People typically wear wedding rings on their left hand in Brazil, Chile, France, Ireland, Italy, Mexico, Sweden, the United Kingdom, and the United States. 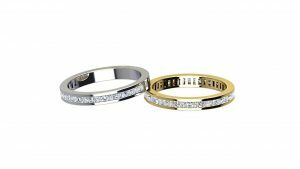 Matching eternity bands for the bride and groom. In Colombia, Germany, Greece, India, Poland, Russia, Spain, and Venezuela the wedding ring is usually worn on the right hand. In Belgium, ring placement depends upon the couple’s religion, and in the Netherlands, placement typically varies with religious affiliation. Jewish brides place the wedding ring on their index finger during the ceremony, because by tradition, it is the finger with which they point to the Torah as they read. After the ceremony the ring is moved to the ring finger. In North America and Europe, many married women wear two rings instead of one–an engagement ring and a wedding band. These rings are often purchased as a matching set or in a set of three, which includes the groom’s wedding band. The bride’s two-ring combination is sometimes supplemented by a third ring—the anniversary band or eternity ring. 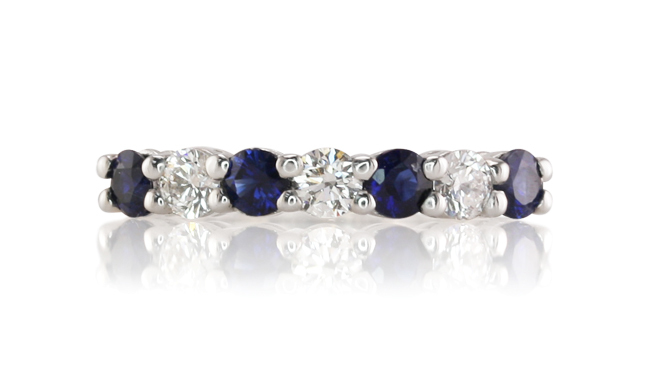 A blue sapphire and diamond eternity band. Most brides wear their engagement ring on the third finger of their left hand. 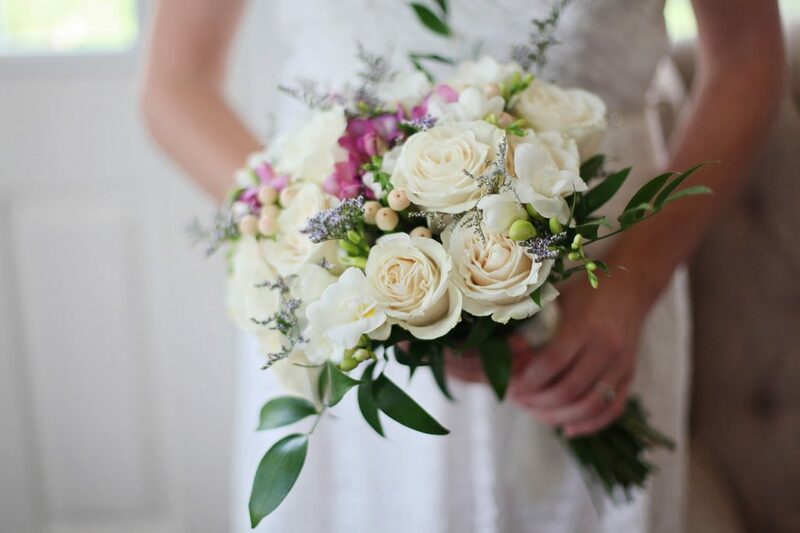 However, in some cases the bride may wear her engagement ring on her right ring finger before the wedding, leaving the left hand open for the wedding band. After the wedding, she may wear both rings together or on two different hands. 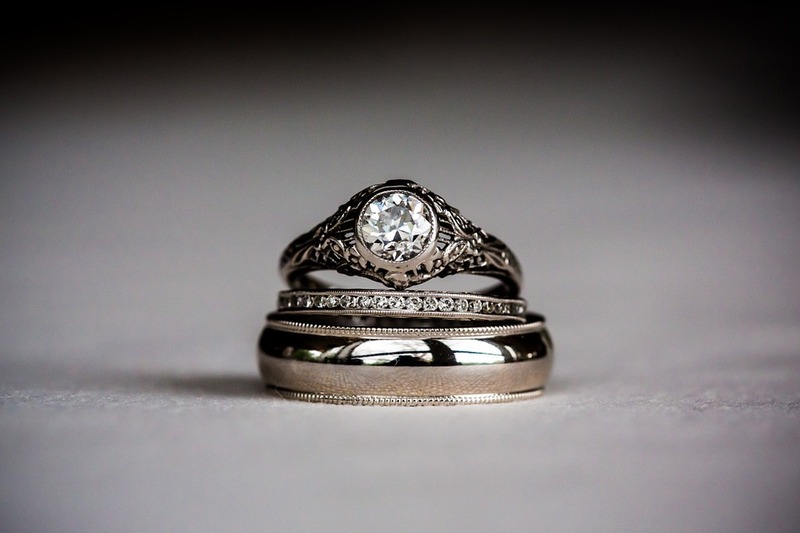 A set of three wedding bands for the bride and groom. Engagement rings and wedding rings that are designed to be worn together can be soldered in the back to keep them in place and prevent rubbing. 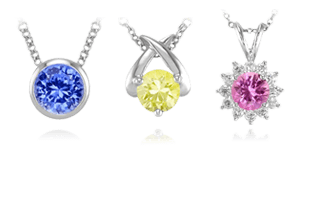 Most jewelers can easily perform this operation just before or after the wedding. There is great variation in the order in which rings are worn on the bride’s finger. The bride may wear the wedding ring below the engagement ring in a position closer to her heart. 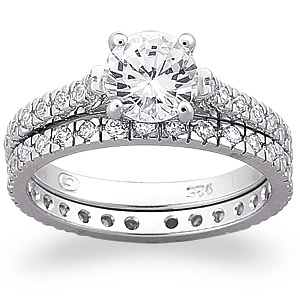 Or, she may wear the ring above the engagement ring to illustrate her advancement from engagement to marriage. A diamond and platinum wedding ring set for the bride after being soldered together. Some women choose to replace either their wedding band or engagement ring with an eternity ring instead of wearing three separate rings. Others prefer to wear all three rings together. 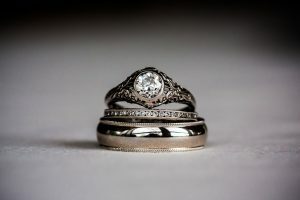 If all three rings are worn at the same time, the eternity or anniversary band is typically worn above both the engagement ring and the wedding band. 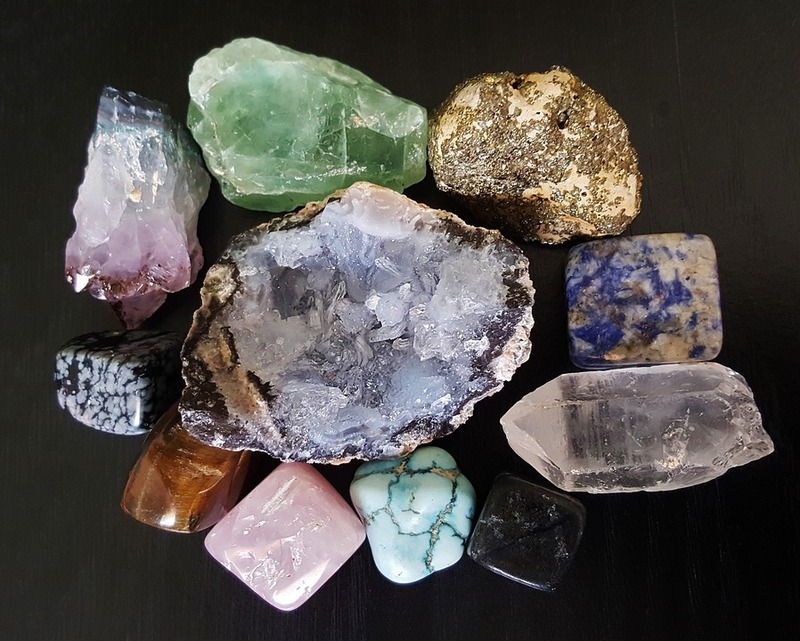 As we further explore the wearing of love rings, next we cover Love Rings for Magic and Healing | A Selection from History.